America is a place that is defined by its neighborhoods. Our country is nothing more than a string of communities that have been knitted together over time. Friendships were forged in the neighborhood bars and restaurants. There was at least one in every town; sometimes, one on every corner. Long before Applebee’s usurped the name, a neighborhood bar and grill was the place that truly helped define a community. The rise of housing developments and shopping centers helped lead to the decline of the traditional neighborhood. And today it seems like more friendships exist through social media than in our towns. The one place where the word neighborhood still means something is in our cities, and Reading is no exception. One of the most recognizable of the city’s neighborhoods is the Centre Park Historic District, a mix of Victorian mansions, quaint row homes and the beautiful open space for which the neighborhood takes its name: Centre Park. The neighborhood is a true treasure for the city, one with a personality all to its own. And inside this neighborhood is a restaurant that perfectly complements its surroundings. Sofrito Gastro Pub sits on the corner of Douglas and Thorn Streets, just a short walk west from Centre Park. The front of the building looks more like the adobe homes of the American southwest than the stone mansions of Centre Park. Our table was pushed against a support pillar, and on the other side, the Bryan Betts Group was serenading patrons with their smooth jazz sounds. When the weather’s warm, diners can take the party to the outside deck, where a large mural of city’s history adorns one of the large outer walls. Sofrito’s menu is as eclectic as the atmosphere, drawing inspiration from across the Caribbean islands and Latin America, with a few American favorites thrown in. 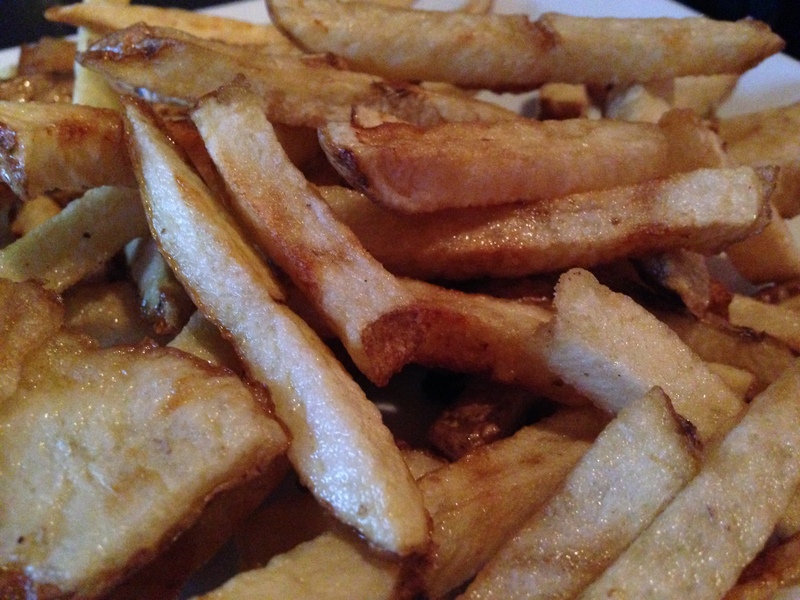 We started with a half basket of fresh-cut fries (a steal at just $2.00), still glistening from their bath in the deep fryer. My entree also came with my choice of starter salad. I opted for Sofrito’s original creation, the Centre Park Urban Salad, a spring mix with Spanish olives and red peppers tossed in a rosemary garlic and brown sugar vinaigrette (which I found also makes an excellent dipping sauce for the fries). 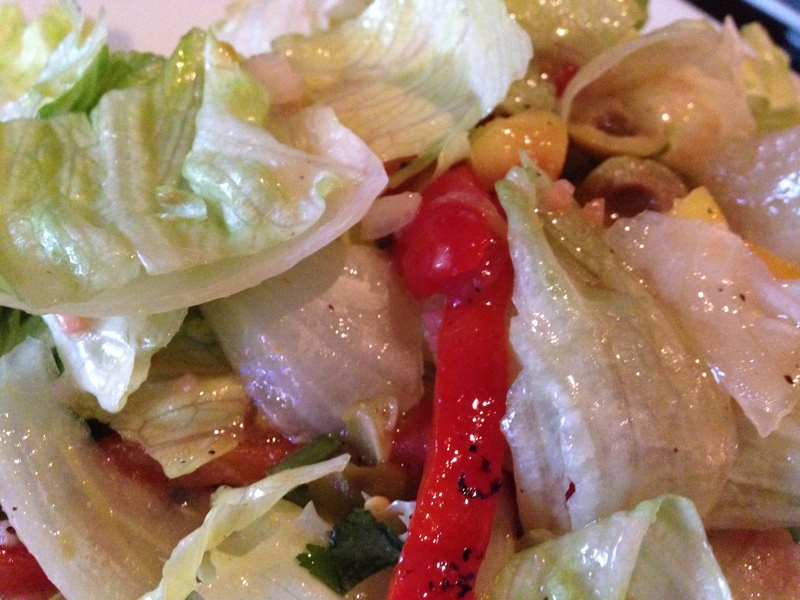 It was a hefty salad to start, and before I could finish it, my main course was on the table. And for my main course, I chose mofongo al pilon. 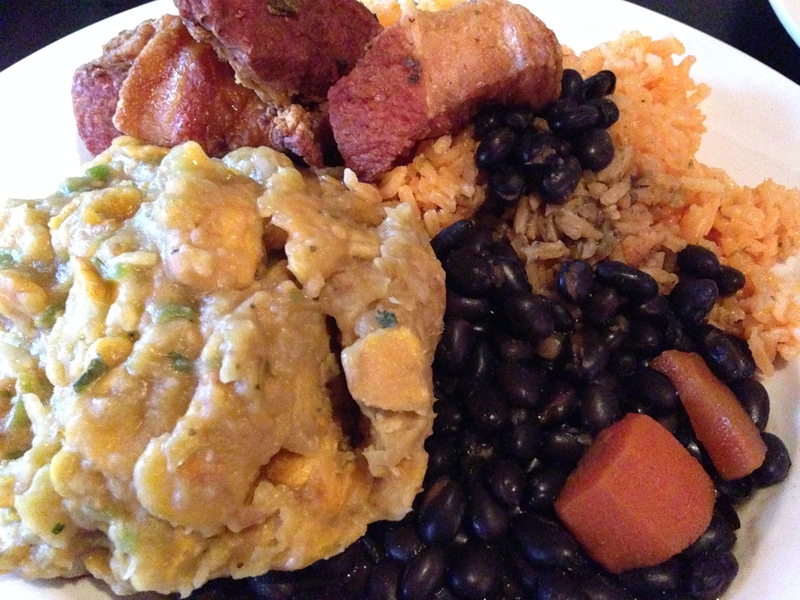 Mofongo is a Puerto Rican specialty of mashed plantains, in this case mixed with onions, garlic and cilantro and topped with chunks of fried pork and served with black beans and the brightest yellow rice I have ever seen. The cilantro really came through in the mofongo, which was much heavier and more filling than I had expected. The pork was fried to a golden brown and was very good, though a couple pieces were a little too fatty for my taste. Overall though, it was excellent in both presentation and taste. 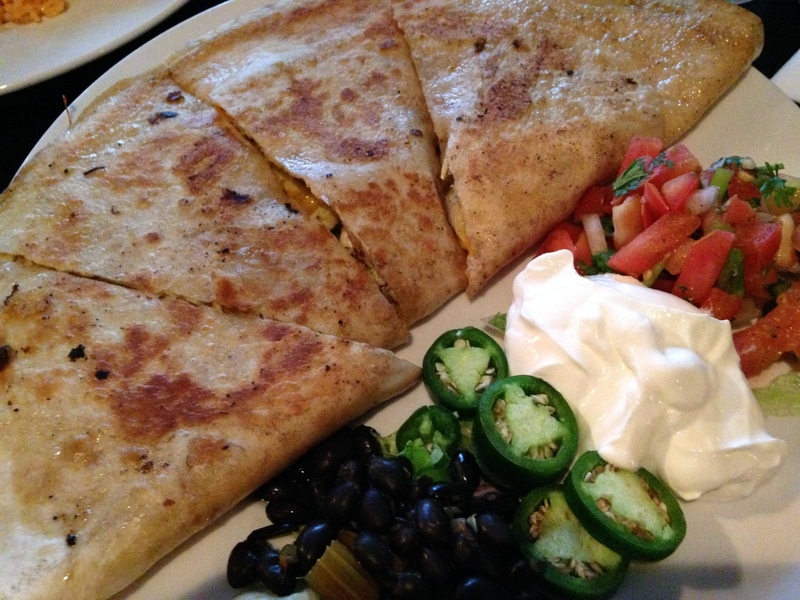 My wife opted for the chicken mango quesadillas. The chicken had a nice char from the grill, which mixed well with the sweetness of the mango. Add in the locally made tortilla and gooey cheese, and it was an awesome dish, one that was big enough to also enjoy for lunch the next day. 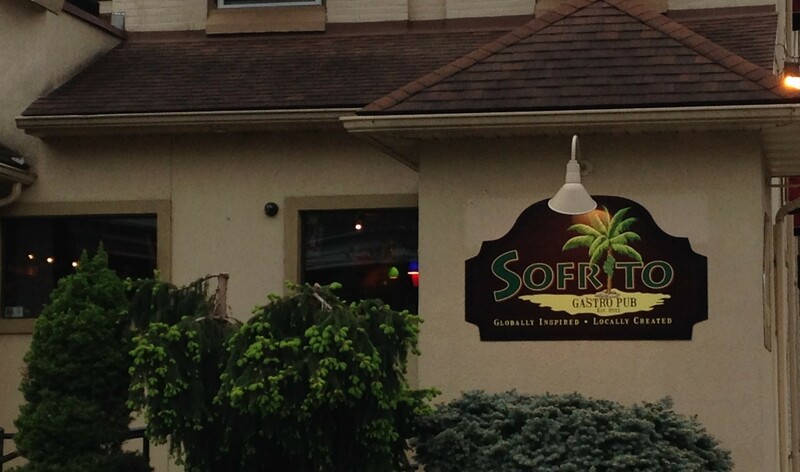 Sofrito’s motto is “Tu sabes!” which, according to Google Translate, means “You know!” Judging by the full tables and bar stools, it’s safe to say that a lot of people know about Sofrito’s great food, unique atmosphere and reasonable prices (less than $25 for our meal). It’s a true neighborhood gem, one that adds to the unique character of Reading’s Centre Park district. But more importantly, it’s a great place to enjoy a great meal. Sofrito’s pork is the most divine creation I’ve ever had. Whether in their bar tacos or Cubans, it will not disappoint.